We receive our fresh water from the skies above, the ground below and the rivers and lakes. All are scarcer now, under heavier demand, and are also subject to greater and greater threats of pollution. 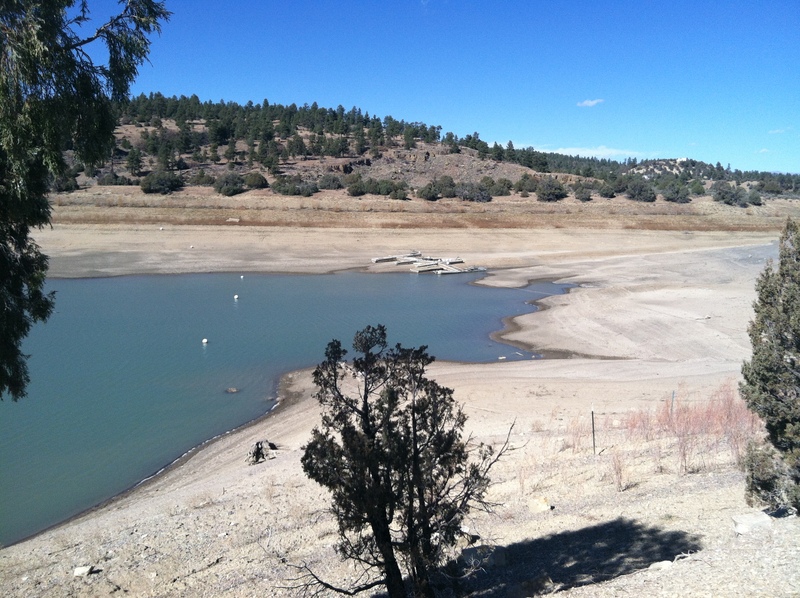 Here in New Mexico we are in a period of extended drought. Below us, the Ogallala Aquifer that provides most of the underground water for a number of states is being depleted 14 times faster than it can replenish. Some water tables have dropped more then 150 feet. Ten of the world’s major riversrun dry before reaching the sea, our Río Grande being one of them. Populations are growing. Cities in NM are expanding as people are drawn here. The crisis is no longer on our doorstep; it has come to live with us. Michael Aune (pronounced “on knee”) has traversed the mountaintops and valleys of many of the country’s waterways. He has walked most of the rivers and arroyos that feed the Río Chama, the Rio Grande and the Colorado River. He has been to the reservoirs and headwaters that supply Santa Feans with drinking water. He has seen miles of drought-stressed trees. He has seen Heron Lake at 35 percent capacity, noted the lack of snow, and knows that there’s trouble ahead—that there is not enough water to sustain our current level of consumption, and soon we will be running pretty low. The Nichols and McClure reservoirs above Upper Canyon Road provide 1.6 million gallons a day. There is not adequate replacement water coming down the river to sustain this usage. 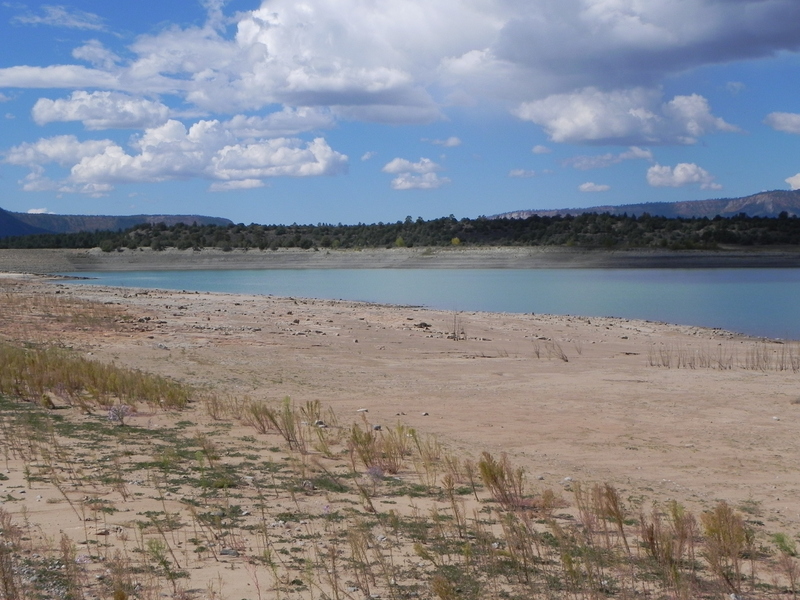 According to the statistics published in The New Mexican on Oct. 10, 2012, the Santa Fe Canyon Reservoir is at 28.5 percent capacity. 13 wells in the Buckman well fields and a few other wells in Santa Fe supply the rest of the city’s municipal water. The Buckman Field wells have not been used recently. 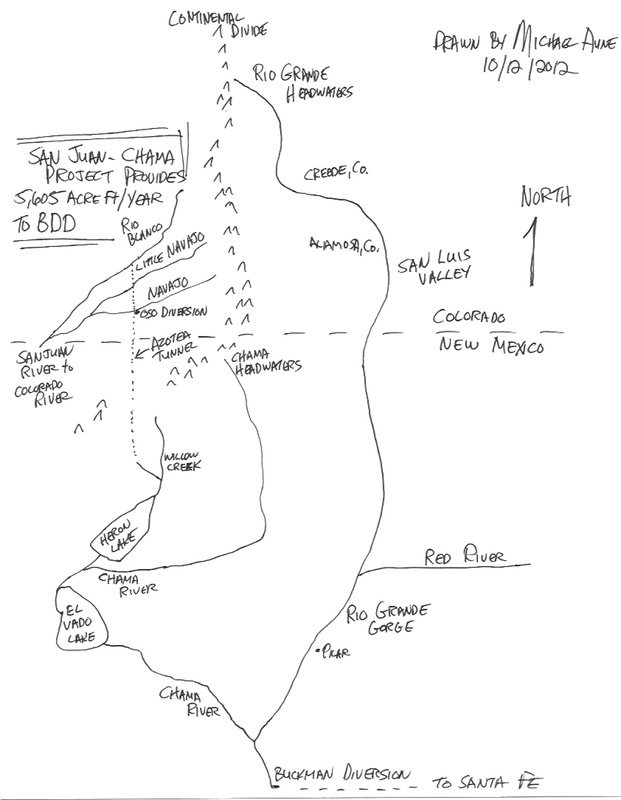 The Río Grande provides Santa Fe with water it receives from the San Juan-Chama Project. Through this compact, 5,605 acre feet of water a year gets diverted from the west side of the Great Continental Divide through the Azotea Tunnel into the Chama River via Heron Lake. 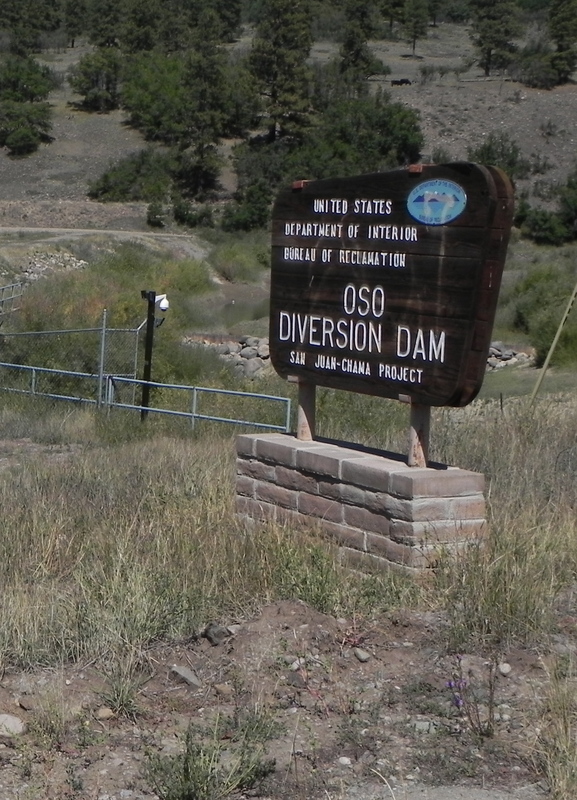 The Oso Diversion Dam collects water from the Río Blanco, Little Navajo and Navajo rivers on the west of the Great Divide from where it goes through the tunnel. 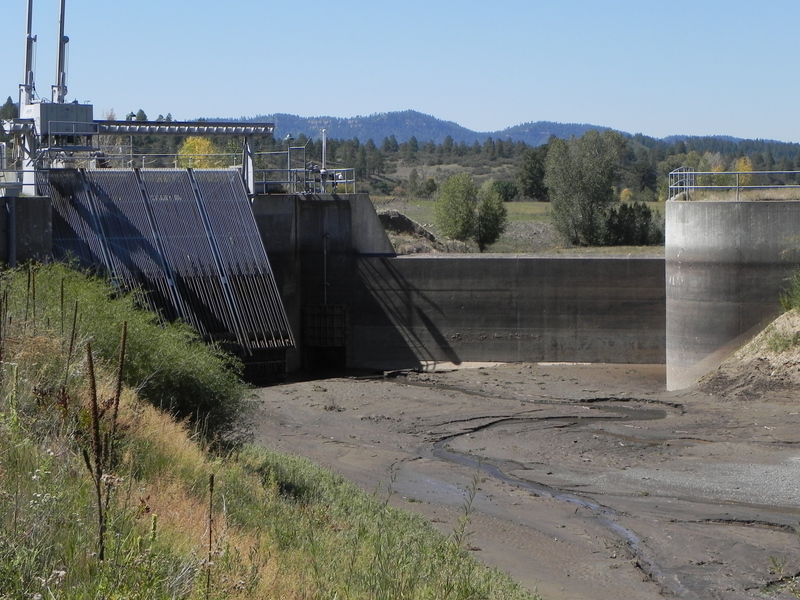 Michael Aune visited the Oso Diversion Dam four times since June 2012 and has been there and to Heron Lake as recently as Sept. 16 and 29. He took the accompanying photos of the lake, which is 45 feet below “normal” and has accumulated 18 feet of silt over one year! The Río Chama joins the Río Grande North of Española. At the Buckman Direct Diversion site, raw water is pumped towards Santa Fe. A thirsty golf course and the luxury community of Las Campanas receive a share on its way. Eight million gallons a day comes from the Buckman Diversion. All these sources of supply depend on rain and snowfall. Santa Fe’s year-to-date average rainfall is 11-1/2 inches. It is now only at five-and-a-half inches. Aune states: “I examined the headwaters of the Río Grande above Creede, Colorado. Flows are extremely low there as well, and I spoke with residents who were very concerned.” He also told me that the Río Grande is currently quite low, and most of the volume reaching the Buckman area is coming from the Red River, which joins the Río Grande in the Questa area. Drought conditions in NM have promoted the recent spate of severe wildfires. The Cerro Grande fire in 2000 burned over 7,000 acres of LANL property. One-hundred-fifty-thousand trees were consumed in the Los Conchas fire, releasing PCBs, radionuclides and metals into the environment. During the summer thunderstorm season, fondly known as the ”monsoons,” toxic ash residue from the fires gets washed down the arroyos and canyons, as there is no longer any vegetation barrier to slow it down. This slurry enters the Río Grande about three miles above the Buckman intake site. An Early Notification System near the mouth of the Los Alamos Canyon is designed to measure high runoff and relay a message to shut down intake during these heavy storm incidents. In a number of reported cases, these warnings were ignored or did not work. The monitoring of contaminants entering the Santa Fe municipal water system is far too infrequent, and years can pass before testing results are released. The most recent report available from the Environmental Working Group, for instance, was issued in 2009, presenting data from 2004-2006. It lists 32 contaminants in Santa Fe’s municipal water.4 Often, data of toxic presence in the water will be later denied as “mistaken!” Mark Sardella, an engineer who has been monitoring contaminants in the waters for a long time, says that the actual data that last March showed quantities of tritium in the Buckman well field, has yet to be released. Sardella has made numerous attempts to obtain the original data from LANL. It has become clear to me that a major shift in our consciousness is required, and that there needs to be a critical mass of people who are doing something about the water crisis; people who practice personal responsibility where water is concerned. It is also clear that the solutions will have to come from the people themselves, for the leaders we have elected have so far proved not only inadequate at dealing with this crisis but are the ones mostly responsible for its existence in the first place. The issues belong to us here in Santa Fe and also around the world, for in reality, we are interconnected and therefore interdependent. How might we be able to fulfill the vision of a world of clean, healthy and safe water for all life? To start, education about water issues is crucial. 1 Water Consciousness, ed. Tara Lohan, AlterNet Books, 2008. 2 Blue Planet Run, The Race to Provide Safe Drinking Water to the World, Earth Aware Editions/Against All Odds Productions, 2007. A book of resources, solutions and inspiration with amazing photography. Water Awareness, ed. Tara Lohan, AlterNet Books, 2008. This compilation of 15 articles by leading authors, including Miguel Santistevan and Paula Garcia of New Mexico, with foreword by Bill McKibben, is a veritable treasure trove of resources on water issues and suggested solutions and includes a water footprint calculator. Many of the facts cited in this article are derived from this book. Blue Planet Run, The Race to Provide Safe Drinking Water to the World, Earth Aware Editions/Against All Odds Productions, 2007. Another book of resources, solutions and inspiration with amazing photography. National Geographic, “Water, Our Thirsty World.” A special issue, April 2010 A very comprehensive treatment on water issues with excellent photography. Be The Change, How To Get What You Want In Your Community, Thomas Linzey with Anneke Campbell, Gibbs Smith, 2009. Resources on Democracy School and water activism. Raphael Weisman is a retired luthier and harpmaker. He founded the Santa Fe Water Awareness Group (www.WaterAwarenessGroup.wordpress.com), is establishing a water resources center, and is planning the first Santa Fe Global Water Festival, to be held on World Water Day, in March 22, 2014.